With Veeam Backup & Replication 9.5 Update 2 we launched our integration with Cisco HyperFlex. The integration leverages our Backup from Storage Snapshot technology to optimize the data transfer for Veeam backups as well as replications. Since then I got a lot of positive feedback and questions around the integration. That’s why I want to answer the most common questions in this blog post. A brief overview on the integration itself was already done by my colleague Michael Cade earlier this year. Besides this blog post we already started the work on an implementation and best practice guide so stay tuned and check our website regularly. 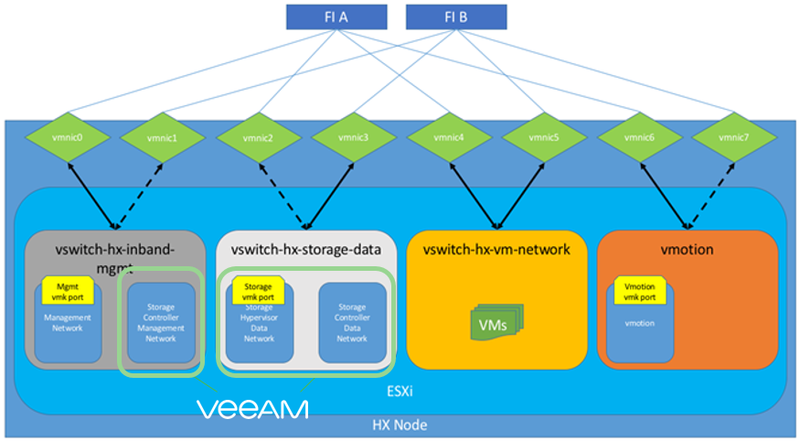 Why does Veeam integrate into Cisco HyperFlex? 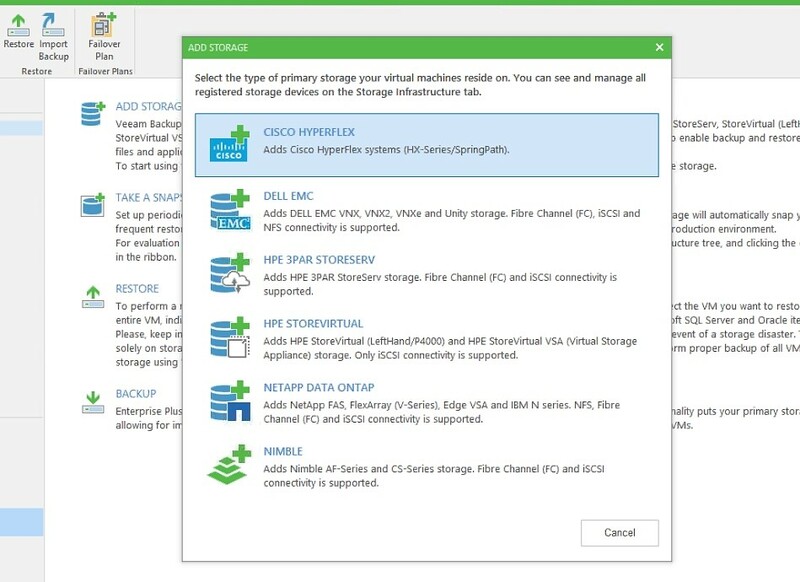 The main reason why Veeam started to integrate into storage arrays, regardless if it is Cisco HyperFlex or any other storage we support, is to avoid or at least minimize the time of VMware Redo-Log Snapshots (native VMware VM Snapshots). If you run a VM backup without the integration, the workflow will always create a VMware Redo-Log Snapshot; Veeam will read all data while VMware redirects all writes into the Redo-Log File and after the backup/replica is done, the VM Snapshot will be deleted as shown in the graphic below on the left side. Especially the VM snapshot delete can take a lot of time and consume serious amounts of storage resources until done. Using the Cisco HyperFlex integration means avoiding VMware VM Snapshots completely. As you can see on the right side in the graphic above, the workflow will create a Cisco HX Snapshot; Veeam reads all data out of the Snapshots and after the backup/replica is done Cisco will delete the HX Snapshot which has almost no impact in the VM or the rest of the production. With that the Veeam integration into Cisco HyperFlex is the only one where no more VMware Snapshots are needed at all. What are the requirements and which Veeam features can be leveraged with Cisco HyperFlex? 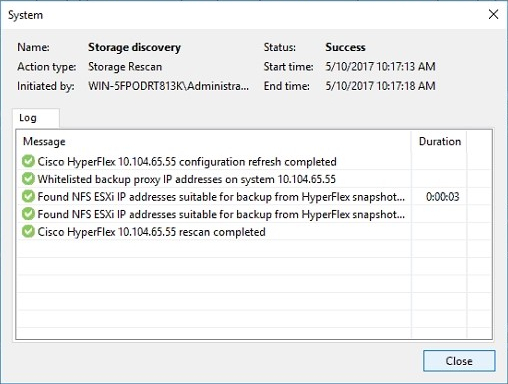 As of today Veeam supports Backup from Storage Snapshots with Cisco HyperFlex. All other storage related features like Veeam Explorer for Storage Snapshots, OnDemand Sandbox from Storage Snapshots, Snapshot only job…etc. are not supported. Of course, you can use all regular Veeam features leveraging the Veeam backup. How do I configure the Cisco HyperFlex integration? 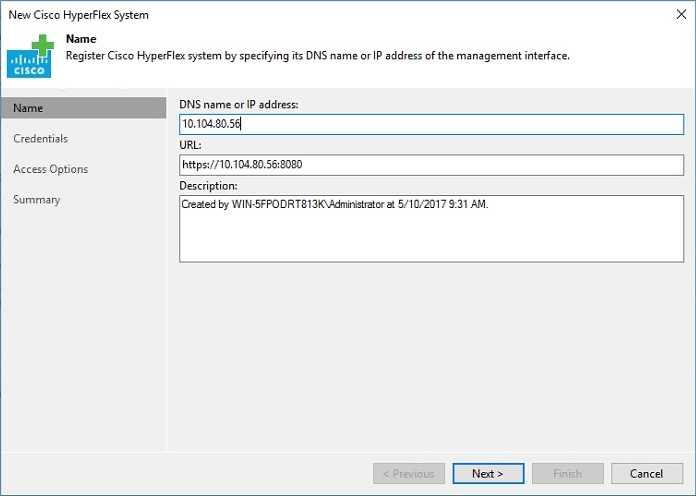 After finishing the wizard, you will see the following dialog that adds the Cisco HyperFlex system to the Veeam installation. 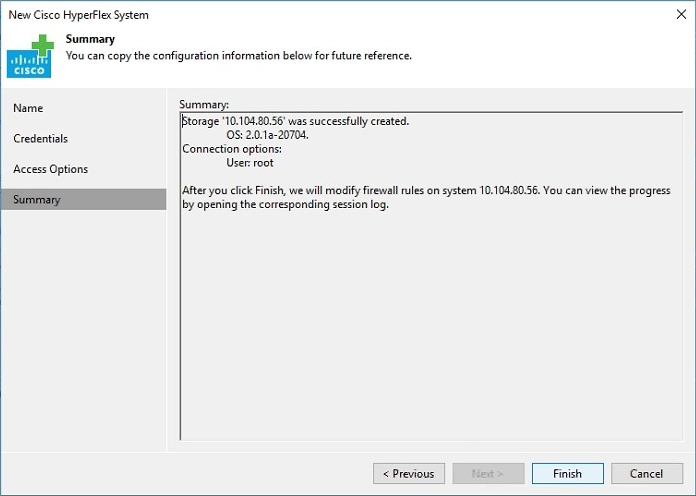 If you see any warning message here the reason is most likely that your Veeam proxy server doesn’t have the needed backend NFS data access or the VMware Firewall ports are not opened. More details in the next questions. 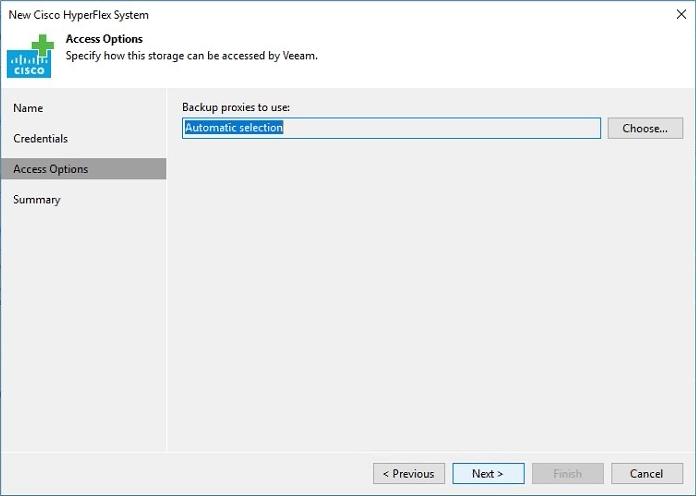 What access is needed on the Veeam Proxy to get Backup from Storage Snapshots working? The Veeam integration with Cisco HyperFlex works with all available data transport modes. 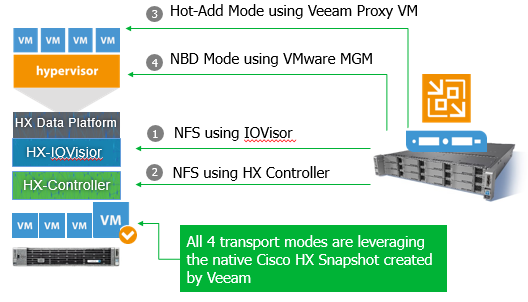 No matter if you use NFS (1, 2) as the transport protocol by accessing the backend Cisco HyperFlex data network or if you use the regular transport modes Hot-Add (3) and NBD (4), Veeam will always leverage a Cisco HyperFlex Snapshot as a source. For NBD and Hot-Add, no additional configuration is needed. After the Cisco HX system is added to the Veeam installation Cisco HX snapshots will be automatically used. Backup from Storage Snapshots over IO Visor on ESX(i) hosts (1): The IO Visor is a Cisco HyperFlex software module that runs on every ESXi host that is part of the Cisco HyperFlex cluster. It presents HyperFlex NFS datastores to the ESX(i) hosts and optimizes the data paths in the HyperFlex cluster. The backup over IO Visor is the preferred method as it provides the high speed of VM data reading and balances the load across the HyperFlex cluster. Backup from Storage Snapshots over HyperFlex Controller Cluster IP (2): In this processing mode, all traffic is handled by a single HX controller that holds the HyperFlex Controller Cluster IP. No matter which NFS mode you use, the Veeam Proxy will need access to the backend NFS data network of Cisco HX. The graphic above shows which networks are accessed by the Veeam proxy server. 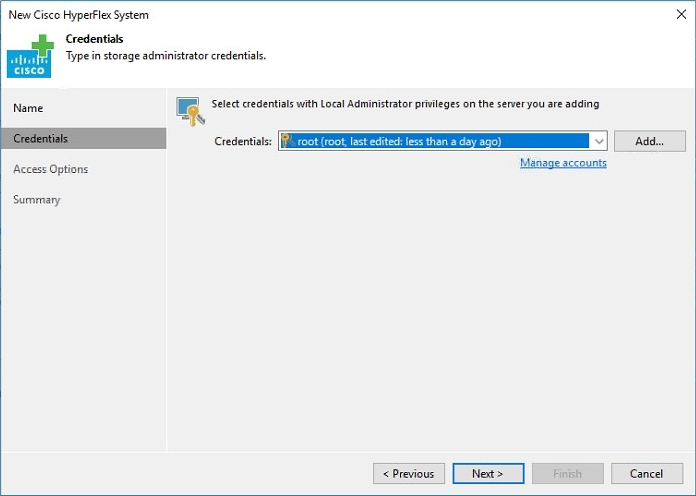 I’m used to saying, configure your Veeam proxy server with the same management and storage access like what you would do with an additional ESXi host. The HyperFlex Controller Cluster IP does not require any additional confirmation as all needed communication will be handled by Veeam and Cisco APIs. For the IOVisior backup you need to open specific VMware Firewall ports as the Veeam proxy server needs to access a module running within the VMware ESXi. Information on how to open the needed ports is listed in the next question. How do I open the needed VMware Firewall Ports? The Cisco HyperFlex IO Visor is a software component that runs on all ESXi hosts within a Cisco HyperFlex cluster. It works as an NFS server for Veeam traffic. You need to allow NFS traffic from the backup proxies to ESXi hosts. As Cisco IO Visor based NFS communication uses dynamic ports, you need to create an ESXi firewall rule with inbound ports 0-65535 and the backup proxy IP addresses as allowed IP addresses. Create a VMware ESXi host VIB host extension file that creates the firewall rule, install/enable it on all hosts and set the backup proxy IP addresses as allowed ones. For more information, see KB article 2291. Use a predefined VMware ESXi host extension VIB file from the Veeam Community GitHUB project. For more information, see KB article 2298. Use ESXi command line interface to create a temporary firewall rule (until the next ESXi host reboot). For more information, see KB article 2299. As you can see the integration is very powerful and there are a lot of details when it comes down to the configuration. Veeam Backup & Replication 9.5 Update 2 offers Availability for Cisco HyperFlex 2.0 by providing both an optimized backup and replication workflow to lower the recovery time and point objectives (RTPO) to < 15 minutes for ALL applications and data running on top of it.